And, of course, “Minecraft,” which shifts endlessly, offering a new world each time it’s played. Braben is also one of the co-founders of the Raspberry Pi Foundation, so he’s deeply aware of the power locked inside even the smallest of today’s computers. So as Braben watched the growth in computer processing power since 1984, he wanted to apply that to his game series one more time. In 2012 he launched a Kickstarter campaign promising “the richest, largest gaming sandbox ever created, set against a backdrop of raw anarchy, galactic powerplays and intrigue.” It ultimately raised nearly $2 million from 25,681 backers, and the game’s next evolution was underway. The 2015 game “Elite: Dangerous” boasts a galaxy of 400 billion star systems, as well as planets and moons all orbiting in real time. Even the game progresses in real time, albeit 1,286 years into the future. In the year 3304, players start with their own spaceship and 100 “credits,” then try to make more money, either legally — by trading — or illegally, through piracy, bounty hunting, and performing the occasional interplanetary assassination. It’s also a video game-shaped testament to how much technology has improved, as well as how long our fascination with space-based games has endured. The Commodore 64 version even had a primitive musical score that’s still fondly remembered. “I’d listen to the game’s simple but beautiful rendition of the Blue Danube as my craft spiraled delicately toward the space station entrance,” wrote a reviewer for The Guardian. It’s commemorated in the new game with a gorgeous symphonic rendition of the same piece when your spaceship triggers its auto-docking sequence. The game now supports virtual reality headsets, for an immersive traveling-through-space experience. “One of the things that I really wanted to get across — and hopefully we have — is just the vast scale of our galaxy,” Braben told one interviewer. The game even features abandoned outposts from space pioneers who didn’t survive the immense journey. The company has released some play-testing content for gamers who purchase special memberships. And at this year’s SXSW, the game’s developers applauded the involvement of their community, which had already posted 4.5 million comments on their forum for the yet-to-be-released game. 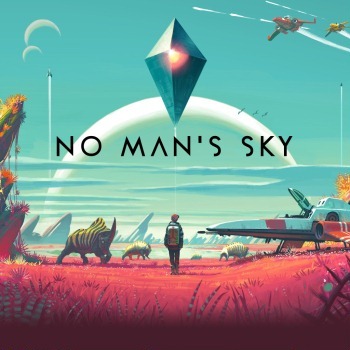 After three years of development, “No Man’s Sky” was released this August, offering 18 quintillion (1.8 x 1019) planets scattered throughout its own virtual star systems, each populated with its own ecosystem consisting of plants, animals and, of course, aliens. Players mine for resources and embellish their home bases in another vast and detailed universe. Ironically, two weeks later, an overflowing river flooded their earth-bound studio with waist-high water, destroying “tens of thousands of dollars’ worth of equipment”. And apparently there’s some story elements scattered throughout the explorations, with a kind of resolution hidden somewhere at the center of the universe. To be fair, the game continues to add features — a new update was released in March. And it represents a pretty impressive technical accomplishment. CNBC points out there were just 12 developers at the company, versus the hundreds of developers that normally work on a popular title. To explore it all, Murray told CNBC, it would take millions and millions of lifetimes. It attracted a curious fan base. In the game’s first 24 hours, players discovered over 10 million species of alien — before the PC version had even been released. It is a testament to how amazing our network coders are that Discoveries are still working at all. And it will always be a part of the conversation about the viability of procedurally-generated worlds. It’s a thought echoed by The Guardian‘s reviewer, who suggested some of the backlash was a result of the game’s life-like recreation of the real world, with its own lack of direction. He reaches a nuanced conclusion that “as a product the game falls short in many practically understood ways. As an experience it can be utterly transcendental.” But he also asks if today’s gamers just lacked the patience that the 1980s game required. Video games are now being used to teach history. When there’s no cathode ray tubes, will we also lose classic arcade video games? Vinyl record sales reach a 30-year high. Engineer recalls an early business partnership in the 1970s with young Bill Gates and Paul Allen. The new popularity of electric bikes. Someone’s invented a new guitar that makes it easier to learn how to play. A motion-tracking dartboard moves to make sure you always hit the bullseye. Two major U.S. firms tricked out of $100 million. Coffee shops are struggling to adapt to a deluge of online orders. How AT&T tried to retrain 100,000 workers. What we learn from a resume-sending bot that applied for thousands of jobs. The iconic bull-on-Wall Street sculpture is now being stared down by a new ‘Fearless Girl’ sculpture. 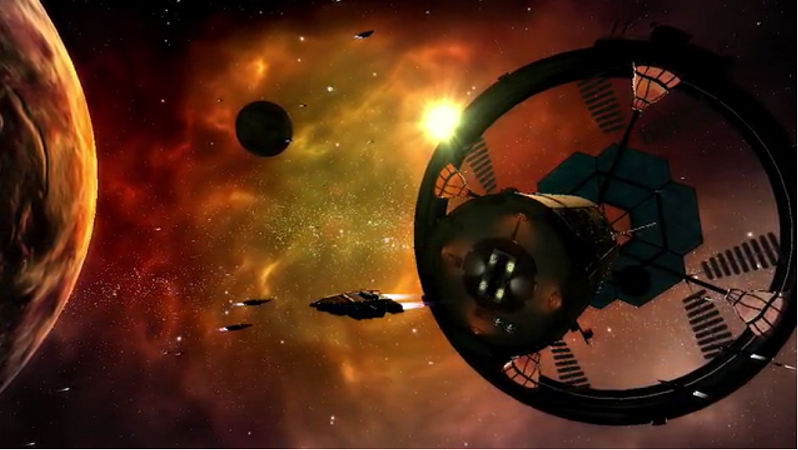 Feature image: Screenshot from “Elite: Dangerous” trailer on Kickstarter.